Around 15,000 former students received a wonderful holiday gift this season, as their extant student loans were discharged under a newly-implemented regulation from the Department of Education. The rule applies to certain students whose schools closed while they were in attendance, allowing them to cancel loans automatically without having to resort to debt settlement, bankruptcy, or other debt elimination options. In October 2016, one of the final acts of the Department of Education under President Obama was to pass a series of regulations intended to protect students or former students against post-secondary schools engaging in predatory or misleading tactics. The regulations apply to schools that lied about their graduate’s job placement rates or otherwise violated consumer protection laws. Part of the regulations enhanced borrowers’ ability to bring “borrower defense” claims, which would allow students who were tricked into attending these for-profit schools to cancel their federal student loans under certain circumstances. The regulations were meant to push loan forgiveness claims brought by students at those predatory schools to the top of the list, to expedite the loan forgiveness process. The regulations were set to go into effect in July of 2017. The current Department of Education, headed by Education Secretary Betsy DeVos, blocked the implementation of the regulations, intending to amend or remove them. A recent court decision, however, found that the Department had failed to meet the appropriate standards for federal agencies wishing to amend or withdraw a regulation and could no longer delay implementation of the policy. The rules went into effect in October 2018. The regulations provide special protection for students who attended schools that closed while they attended or shortly after they left. 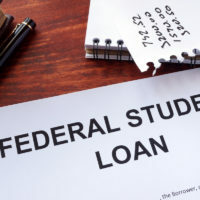 For students who took out federal student loans to attend schools that closed while they attended (or within 120 days of the students’ withdrawal), the rules provide that their loans are automatically canceled after three years, assuming they did not enroll in another college. Pursuant to the “closed school discharge,” the Education Department is now discharging some 15,000 student loans. The discharge is automatically triggered three years after the closure of a particular college even without the borrower applying, although borrowers can apply for forgiveness under the rule at any point after the school’s closure. The borrowers will no longer have to make payments and may even be eligible for refunds. Moreover, any negative impact on their credit reports stemming from these student loans will be erased. Since November 2013, almost 3,600 schools such as ITT and Corinthian have either closed certain campuses or shut down entirely, per the National Student Legal Defense Network. The closed school discharge announcement is a welcome gift for borrowers who were cheated by these misleading institutions. If you’re struggling with debt and considering bankruptcy, please contact Rounds & Sutter for a free, confidential consultation. With offices in Ventura, Santa Barbara, and Westlake Village, we represent clients throughout Southern California, offering smart, compassionate legal counsel in the face of life’s challenges.